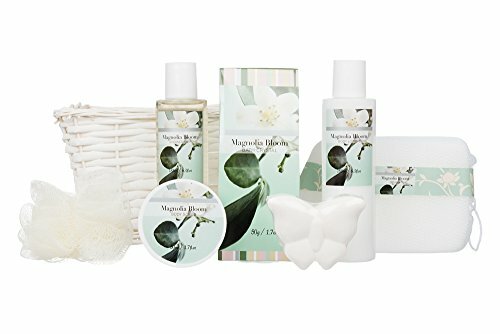 Invero® 7 Piece Ladies Magnolia Bloom Bath Hamper Gift Set – Presented with a Luxurious Wooden Basket, Ribbon and Name Tag – Ideal Gift for Loved Ones, Family or Friends. The ladies magnolia bloom bath gift set would make a perfect present for a loved one or family member. The gift set is presented in an attractive basket and packaged with an attractive ribbon and attached name tag. Presented in an attractive basket and packaged with an attractive ribbon and attached name tag.